In the last one month, I caught two television dramas. 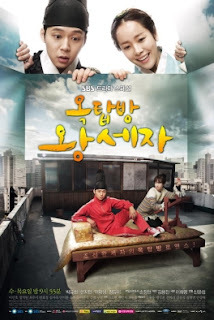 The first one I really enjoyed was a korean drama, The Rooftop Prince. This one was aired over Shuang Xing channel on Astro Malaysia. The second one is Eternal Happiness (2002) by TVB, currently showing on Wah Lai Toi. The story is essentially about a Crown Prince, Lee Gak, whose wife was murdered, and through some mystical special forces, he was thrown into the 2012 timeline, where he meets the same reincarnated 'souls', and how he manages to finally solve the murder case in the end. I like this kdrama, as it made me really happy and wonder about the characters. What I really liked about the drama was how Micky Yoochun portrayed the character of the Crown Prince Lee Gak, and he did have a certain chemistry with the main actress, Han Ji Min. Indeed his acting skills has improved by leaps and bounds since Sungkyunkwan Scandal in 2010. Language wise, having learnt to read and speak Korean language for close to three years, I always switched the conversation to to Hangugeo when I watched it. My mother also followed the broadcasting of this kdrama, except that she watched it dubbed in mandarin, with chinese subtitles. I do believe the speakers who dubbed it are from China due to the terms used. Most popular China mandarin speakers I heard most during the broadcast was 'chui na er' (where you going?) which I used to say alot coz I had a lot of preschool China children when I was working in Sydney and they were always heard saying it. Lol. For first time kdrama viewers, you will learn a lot about Korean culture through this drama. For those who are familiar, you will be pleasantly surprised.